Oops - I didn't realize this was the viz reports thread! More reports People!! Cool Pics! I love the octo - it looks like an alien even more than "normal"! 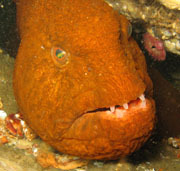 And the sculpin chowing down on a - what is it? - a perch? What a great find! Lots of great stuff in the water right now - we've got the end of Summer warmth still (52 or so), beginning Winter viz, and still the number of critters that is left over from Summer before they start going whereever they go for the Winter. Get out there and dive! It was maybe 2-3 " across, Ben. We saw four baby reds, one GPO and a few grunts. "When I'm 80 I'll take up real diving, which is done in a pub..." Ray Ives. Nice pictures as usual, Ron! How small was that octo? From its proportions it looks like maybe it was REALLY small? Did two dives with Bassman tonight at Redondo. Viz was 20-25 fsw and the critters were out in force! cardiver wrote: Any pics/report to follow? Wish you could have been there as well! Anybody know when our Winter viz will finally arrive? Good for you, Tom! I wish I could have been there today. Any pics/report to follow? There was this weird and disappointing algae bloom in the water today that made viz in the shallows 10' or less. It opened up to maybe 15' or a hair more in spots at depth, but it still wasn't good. So disappointing! As you're gearing up in the shallows it looks so promising, "Viz should be great!" 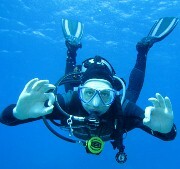 - then you drop, and Oh well, good to be back diving in the cold! BASSMAN wrote: Thea Park, AKA "The Mud Pit" On 9-27-08 Vis all the way down to 75 FSW = 1 to 3 feet! vis opened up a little at 30 FSW coming back up and then went back to the 1 to 3 feet at 20 FSW, this Vis was the worst I've seen yet in P.S. Washington. 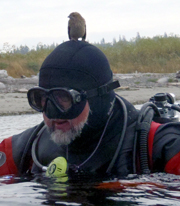 Sigh... Keith, Keith... what have I told you about diving around the Puyallup? You expected different maybe? Did you even find the barge? Nope! If we did, we did not see it! We probably swam right by it or over it. Hi, my name is Keith, and I'm a Dive Addict! Just got back from three days of diving and camping at Porteau Cove, the dive park between Vancouver (BC) and Whistler. Vis was amazing all three days ... 50 feet or better on every dive ... despite the large tidal exchanges. This was my sixth camping/diving trip up there in the past seven years, and by far the best vis I've ever seen there. Amazing what the structures look like when you can see them ... on one dive I could see the entire sunken bridge from the Granthall. That's gotta be close to 100 feet. We attempted one dive at Whytecliffe, but currents damn near blew us off the wall and out into the deep ... so we turned the dive barely after it started. Vis was stil awesome ... I could see starfish and crabs getting blown off the wall from maybe 40 feet away. Harper's Ferry this afternoon was great, about 25 feet and very little guck in the water. Thea Park, AKA "The Mud Pit" On 9-27-08 Vis all the way down to 75 FSW = 1 to 3 feet! 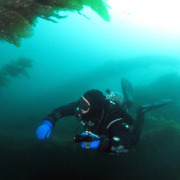 Grateful Diver wrote: Cove 2 last night was awesome ... at least 30 feet of vis. And even better earlier in the day. Cove 2 last night was awesome ... at least 30 feet of vis. Alki Pipeline 5pm yesterday - 15ft average with occasional 30ft. Still a nice colorful natural-light dive. Strawberry Island in Deception Pass, very murky 5 feet at best. Viz at Les Davis this afternoon was about 20-25 down around the reef. There was a pretty severe halocline up in the shallows, but it only went down about 5 feet. Sounder wrote: I'm guessing, and hoping, that Tom is refraining from spending time on the computer and is, instead, diving his arse off. You could say that again! I knew it was only a matter of time before I got a taste of my own medicine. GUE Seattle - The official GUE Affiliate in the Northwest! I'm guessing, and hoping, that Tom is refraining from spending time on the computer and is, instead, diving his arse off. cardiver wrote: Bassman and I did Redondo at 1930 tonight. Viz was 15-20 fsw at depth and half that above 30 fsw. Wow that was a quick post, nice pictures again Ron! Thanks, Keith. That was a great dive tonight! Where's the vis report from Bonaire?